The Communist Party of Australia recognizes the significant contribution to the International Communist and Workers’ Movement made by the meetings of Communist and Workers’ Parties in Athens and Sao Paulo. These meetings have strengthened and developed political and organizational understanding, contact and common action throughout the world. These meetings have led to significant advances for the anti-globalization movement, trade unions and progressive governments. The 10th Congress of the CPA resolves to maintain and strengthen our work with communist and workers parties in our region with the objective of establishing and strengthening fraternal relations and the building of the anti-imperialist movement. Congress welcomes the on-going development and strengthening of relations with the Socialist Party of Aotearoa and the JVP of Sri Lanka and calls on the Central Committee to develop relations with communist and workers’ parties in the Asia-Pacific region.? The 10th Congress of the Communist Party of Australia, having recognized the fundamental importance of building the Party in the working class, calls on the incoming Central Committee to develop policy and tactics for the building and strengthening of the Party in workplaces and within the trade union movement. The CC should make an examination of State and District organizations to determine whether or not it is possible to create workplace and/or industry branches in the various areas of Party work. The CC should direct State and District organizations, where it is appropriate, to re-organize branches to achieve the development of workplace and industry organization. The incoming CC should work to have all Party organizations actively involved in the campaign to defend workers rights against the onslaught of the Howard Government’s industrial relations proposals. The Party’s campaign efforts can involve locality organization through local meetings, leaflets and stalls. The Party reiterates its call for all Party members to play an active and prominent role in their trade union. Every member must be an activist in building a mass campaign of opposition to the proposed anti-worker laws. Every Party organization should arm itself for the battles ahead and work to unite workers and the community at large in defense of their living standards, working conditions and democratic rights.? This 10th Congress of the Communist Party of Australia opposes the continuing occupation of Iraq and Afghanistan by US-led military forces and calls for an immediate end to these occupations, to allow the peoples of these countries to determine their own futures. We express our solidarity with the popular and progressive forces struggling to end the occupations of Iraq and Afghanistan. Only when the peoples and countries are united and free of these barbaric invaders can complete and full democracy and sovereignty be achieved for Iraq and Afghanistan. This Congress calls on the Australian Government to withdraw Australian troops from Iraq and Afghanistan and provide aid for the genuine reconstruction of these two countries.? The 10th National Congress of the Communist Party of Australia salutes the five young Cuban patriots illegally held in US prisons. We call on the Bush administration to immediately release them. In August 2005, the successful appeal before the 11th Circuit of the Atlanta Court of Appeals unanimously quashed their convictions. The court stated there was no possibility of a fair trial in Miami and ordered a new trial outside of Miami. It is the belief of delegates at this congress that no crime was ever committed by these young people. This National Congress calls on Party organization to join the thousands of people around the world demanding the immediate release of the Cuban Five. Congress supports the nomination of the Cuban Five for the Nobel Peace Prize 2005.? We the delegates of the 10th Congress of the Communist Party of Australia condemn the establishment of an office of the United States’ Federal Bureau of Investigation (FBI) in Sydney. As recently as December 2004 the American Civil Liberties Union (ACLU) issued a report highlighting FBI spying and infiltration of grassroots organizations which oppose the Iraq war and other right-wing policies of George W Bush. Historically the FBI has been used to fight dissent by ordinary US citizens, the jost famous victim of this intimidation was Martin Luther King. We condemn the NSW Premier Morris Iemma and NSW Police Minister Carl Scully for organizing and welcoming the establishment of this office. We state that the FBI is concerned with the suppression of civil rights and particularly the right to dissent in a democratic society. We further contend that foreign police agencies have no role in Australia and particularly ones such as the FBI, with an enormous history of working against their own population. If the FBI is prepared to be so offhand about the rights of US citizens how can we expect them to respect Australian citizens’ rights? The presence of the FBI here is a violation of our sovereignty and of our own legal systems. We call on the Premier to remove his offer to the FBI to set up an office in Sydney.? This 10th National Congress of the Communist Party of Australia, CPA rejects the inhumane U.S. economic, financial, political and cultural blockade of socialist Cuba. This is the longest blockade ever imposed on the peoples of any country and it has a direct effect on the well being of the Cuban people. The United Nations Human Rights Commission has rejected it time and time again. On every opportunity the peoples of the world have called for the elimination of the US blockade. It has been supported only by the United States, Israel and jost recently also by Palau and the Marshall Islands. This National Congress calls on the US Government to lift the blockade on Cuba and demands that the Australian Government puts pressure on the US to eliminate this political barbarism. 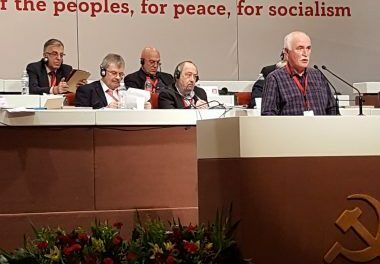 Thesis of The Central Committee of AKEL on The 80th Anniversary of CPC – AKEL On the Congress of the ?European Left Party? World Social Forum Evolves and Approaches the New Socialism Stop?Zionist State?Terrorism!